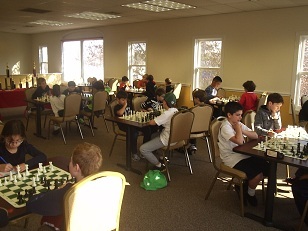 This Veteran’s Day nearly set a record for our largest scholastic tournament turnout! 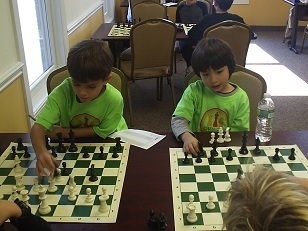 With so many talented children participating, it was anyone’s guess as to who would finish at the top of the table. In the K-2 section, Dream Teamers Ryan Roderick and Jason Lessing placed first and second respectively. Ryan scored a perfect 4/4 score! They were followed by the Cahilly brothers Lundeen and Glen, and by the youngest participant Rex Lu who scored two points! In the 3-5 section there were several players who stood out above the rest. Another Dream Team member, Jack von Riesemann, finished in first place with a perfect score. Close behind him with 3.5/4 was Elliot Greenbaum in clear second place. Nick Boer, Alex Mayo and William Ewald all had strong tournaments and can certainly be pleased with their performances. Our next scholastic tournament will be next month, December 16th and will feature a new 6-8 section which will become a permanent part of our regular tournaments.